As many of you know, our little Luke was born early. He was born at 37 weeks. He's not exactly a preemie, but he had plenty of health issues...which landed him in the NICU for the first 12 days of his life. Since Luke had collapsed lungs, it was very important to keep him healthy, especially the first few weeks after leaving the hospital, when he was at his most vulnerable. RSV could have proven very dangerous for him at that point. We definitely did not want to end up back in the NICU, we were happy to be home. We avoided any public areas for several weeks until Luke was able to be fully recovered and had time for his immune system to build again. Thankfully he did not get RSV, but I have had experience with it. I remember when I was a young working mother... two of my boys were 18 months and 3 months. I was working full time plus overtime, and the boys were in daycare. They often got sick because of germs the other kids brought with them. I thought they had a bad cold, but both seemed to have difficulty breathing, so I took them in. The doctor said they had RSV. I was given instructions to give both boys nebulizer treatments every 4 hours to help them breathe. 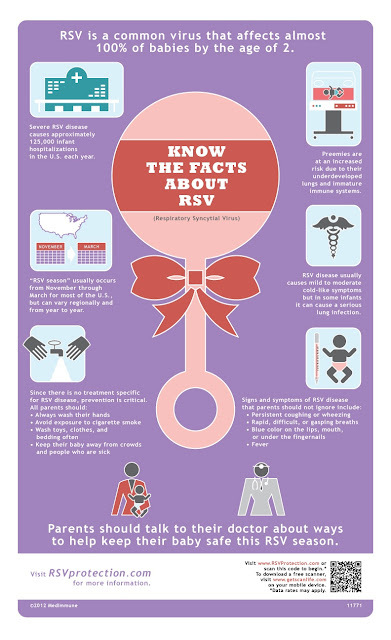 Like the flu, RSV is a seasonal virus. RSV can be very scary, I can't imagine how scary it would be if Luke had gotten RSV, though. RSV can mean that your baby needs to be hospitalized...which is a frightening thought... but there are ways to help protect them. Washing your hands and keeping others from touching your baby before they wash their hands is one of your best lines of defense. If you don't have a preemie, you can help protect them still by always washing your hands before touching a baby, and always asking the parents if it is okay.